I’ve made pizza many times before, sometimes with premade crust, sometimes from scratch and every time it’s good, but not the best. 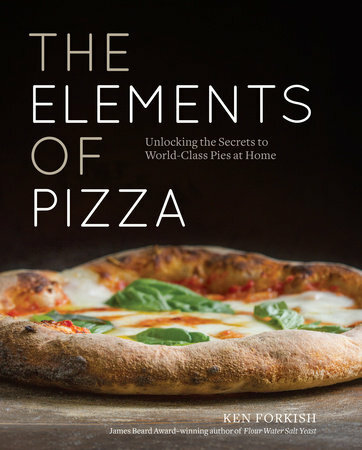 Since I’m always looking for the next best tip I jumped at the chance to order “The Elements of Pizza”, my first and only cookbook on the subject. The author Ken Forkish is a James Beard award winner author of the book, Flour Water Salt Yeast and also owns three restaurants in Portland Oregon, Ken’s Artisan Bakery, Ken’s Artisan Pizza and Trifecta Tavern. Obviously this guy knows his stuff. "The Elements of Pizza" is divided into 7 chapters. The first is titled “The Soul of the Pizza”. This section describes the author’s travels in Italy and how he set out to understand pizza’s history and place in their culture. Next on to Pizza Styles, Eight Details for Great Pizza Crust, Ingredients and Equipment, Methods, Pizza Dough Recipes and Pizza Recipes. In the chapter Pizza Dough Recipes; there are 12 different styles for dough plus one for gluten-free. The recipes are divided into length of refrigerated time. The author explains that time is the critical ingredient, and that also depends on one’s schedule. There are important tips for a great crust such as hydration, time, temperature, climate, mixing and salt. What I found interesting was there was oven time and some broiling time to help get those temperatures up for a great homemade crust. I would definitely recommend this cookbook to anyone who loves pizza. There is a pizza style for everyone and the directions and tips are very concise. The photography is beautiful and the pictures will help guide you through the steps, you will definitely feel the love. Soon after receiving this cookbook, we drove to our summer home in Yachats, Oregon. The first week-end there was a Taste of Yachats Forest, Farm and Tide event in town. The Drift Inn which is one of our favorite places to enjoy a great meal had a come make your own wood fired pizza class/event. There were people of all ages which once again proves the fact pizza is a food for all ages. They taught us how to stretch and press out our dough. I choose to prepare a white pizza; which is no red sauce and just a drizzle of olive oil across the dough. The toppings we selected were slivers of Yukon potato, prosciutto and a little fresh rosemary. 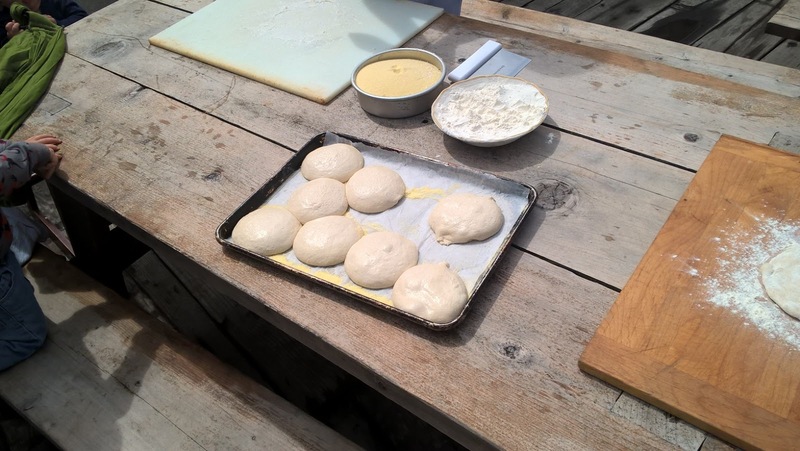 Next I was taught how to cook my pizza on a steel paddle in the wood fired oven. Turning the pizza was not quite as easy as it looks but I gave it my best shot. It’s just like everything else in life I suppose, practise makes perfect. Our pie took minutes to cook and just a few minutes longer to devour, it was amazing. Can’t wait to start making our own at home. Next time we go to Portland, Oregon we are checking out Ken’s Artisan Pizza restaurant. Can’t wait! Hi Moumita, it was a wonderful experience, wish I could have my own brick oven. The crust was amazing. Pizza is one of my favorites dishes and this is such a beautiful and informative post, Cheri. That book sounds awesome! Thanks Anu, I think just about everyone loves pizza. Add the book to my X'mas wish list! The pizza looks superb, Cheri. Thanks Angie, it was a great experience. 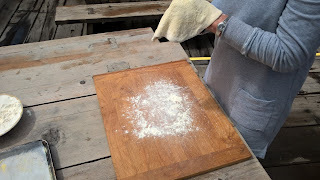 There is a blogger who is an excellent bread/pizz baker/maker..Ann Thibeault..she has mentioned his bread book ..and everything seems to turn out wonderfully..how fun to go to a pizza making class..! Hi Monique, I will have to check out her blog thanks, and yes the class was a lot of fun plus when food is involved it's always better. There's nothing better than homemade pizza and that book sounds like a great place to start! Thanks Caroline, it is a great book for sure. Pizza is truly for everyone; I was saying to my husband the other day that pizza is like the food equivalent of a soundtrack to our childhood...except I love it as much now as then! : ) Sounds like a very detailed pizza book and that class is such fun!! Hi Monica, yes the class was great and even better was that there were people and family of all ages. Take care! Good to know about this book - thanks! Thanks for stopping by Mimi! That cookbook sounds great. I am trying to find a recipe for pizza crust that I love. So far they have been good but not great. Wish I had a brick oven, maybe I should build one in the backyard. Nothing like a crispy crackly crust from a brick oven. Yum. Hi Suzanne, a brick oven would be pretty cool to have in a backyard except for I would probably eat way to much pizza. Gosh I could eat pizza three meals a day! What a fun experience. I thought you might have headed north already. Can't wait to see your garden! Hi Tricia, working like a fiend in the yard, garden is halfway planted. Thanks Ami, I do too, love the crusty crust. Thanks Tandy, I bet that you would have no problem after a little bit. Thanks Dena, currently working on the garden. Fun post! We're spoiled -- we live within minutes of several really good pizza places. So we always go out or order in when we're in a pizza mood. I should start making my own -- sounds like so much fun. Good read -- thanks. Hi John, when in Az we are close to everything, here in Oregon we have to be alot more resourseful. Take care. Hi Marcelle, I found that it is a fun meal to make that the whole family can do and enjoy. What a great tutorial, Cheri, and that cookbook sounds perfect for a pizza lover like me! 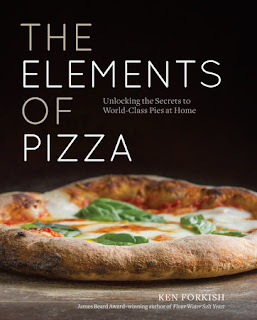 Thanks Marcie, The Elements of Pizza is a wonderful cookbook for us pizza lovers. Wonderful post! I'm just beginning to make my own pizza! Hi Zaza, pizza is such a great meal to make with friends and family, good for you. What a fun and delicious experience you had. I never get tired of pizza and I love that there are so many variations! Thanks Scott, pizza does seem to be the one dish that everyone loves. WOW! What a informative post and pizza looks amazing! Yes, the pizza class was a blast, so nice to see families with small kids there too, having fun. Dear Cheri, would have loved to take a pizza cooking class with you - sounds like a lot of fun. And your book recommendation is wonderful. Btw I love Pizza Bianca myself - isn´t it wonderful?! A class would be fun!! and we had such a great time learning about a brick oven, our pizza cooked in just minutes. yum! i just finished a home-assembled pizza - pre-prepared crust, olive oil, basil, red onion, canadian bacon and cheese. not wood-fired, but still delish! Hi Tex, sounds like a delicious combination, I bet it was delicious! Have a great memorial week-end. Would you believe I have never made Pizza at home, Cheri...I don't live far froma pizza place so I get lazy every once in a while. I should change that:) Perhaps I would if I got hands on lessons like you. How cool is that!!! No problem at all Louise, I am a little behind. The lesson was alot of fun, food always seems to bring people together doesn't it? Have a wonderful Memorial week-end. Must try my hand at pizza making. Hope you get the chance to, it's really alot of fun. Your hands-on lesson sounds like a really useful and fun way to get good at handling dough. I guess access to an appropriate open-fire oven will cramp your style for future practice, though. yes, it certainly will but it was alot of fun while it lasted and there are some tips in the book on how to get your oven heat higher for a good crust. Take care Mae! What a fun opportunity to try cooking in a wood fire pizza oven. I can only imagine the delicious results! Thanks Liz, it was a great experience and very delicious. Hi Kim, that is very interesting about the pizza in Japan, sounds like I would be a big fan. Take care! Thanks for stopping by Telma! What a wonderful event, Cheri! I would love to take a pizza class as I have only made it once or twice in my life. Oh it was such a fun event Susan, I would definitely do it again. Hi Cheri - like you, I love homemade pizza but am always somewhat disappointed in the results. Maybe I need this book! You pizza class sounds wonderful, and I love that style of white pizza! White pizzas are my favorite and I love a crusty crust, Ken's instructions in his book have you switching the oven from bake 500 to broil to get the right effect. Thanks Grace, the event was alot of fun. That sounds like such a great cookbook, Cheri! I have only made pizza dough a couple times so it would be fun to try the different doughs. I would have loved to go to that class where you learn to cook in a wood fired oven. Your pizza sounded amazing. Jeff and I have talked about trying to make a wood fired oven up at our cabin sometime. I think I will need that cookbook if we ever do! Eight Details for Great Pizza Crust, Ingredients and Equipment, Methods, Pizza Dough Recipes and Pizza Recipes. Wow great, I am fascinated to learn the elements of Pizza, I have always been thining to bake a pizza for me, I will be getting the elements to topelectricgriddles.com to start it all up for us both, Thanks for the share.